Hello and welcome to exampundit. After discussing with our mentors in EP, we have come to a conclusion regarding a few things. 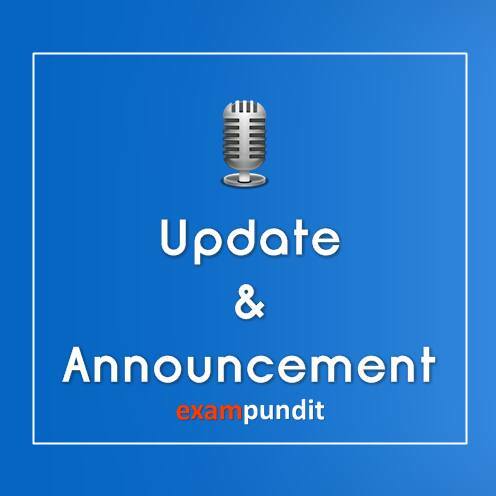 Firstly, Exampundit is all about its aspirants & readers! We thank you guys for constant motivation and inspiration you give us. Now, we are starting a new thing and we are bringing few old stuffs back!! Yeah! Most importantly, there will be no delay in anything in the coming days. Due to some internal problem and co-ordination issues, we have earlier faced some real issues. Which eventually disappointed many of you. So, from now on, there will not be any delay or sudden disappearance of any thing from the site. We will announce if we close anything. 1. A daily discussion page @ 8.30 PM only for Aspirants. Where you can discuss/learn and help. Basic guidelines will be rolled with the post page. 2. Arrangement of quizzes in One Page for you guys. As recommended earlier today, we will soon arrange all the quizzes in one page so you can study better. Reshare Friday – Resharing everything important on Friday so that you don’t miss anything. Thank you for making EP what it is today! You guys are the best! We are also looking for 3 More Mentors, so if you want to be a part, be active, be helpful, we will choose the best!